Below are some Halloween recipes that work. They make for the best food ideas for parties. CLICK HERE to see the Zombie meatloaf before cooking. CLICK HERE to see my Bigfoot meatloaf. 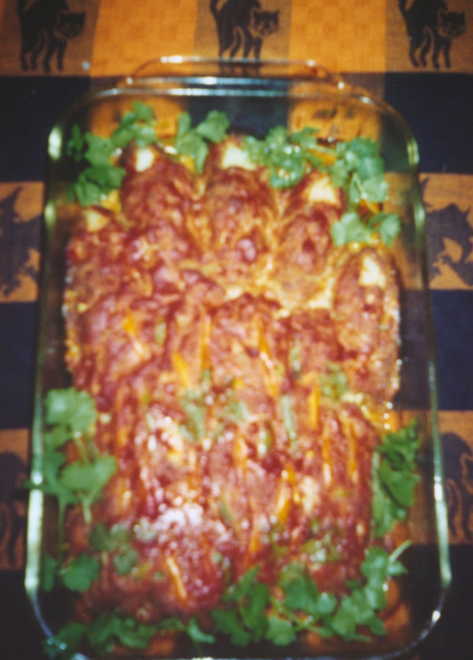 My all-time Halloween favorite, this recipe is best! Looks great and taste wonderful too...if you like meatloaf! Use your favorite meatloaf recipe or use the following one. In a large bowl, combine all ingredients until finely mixed. 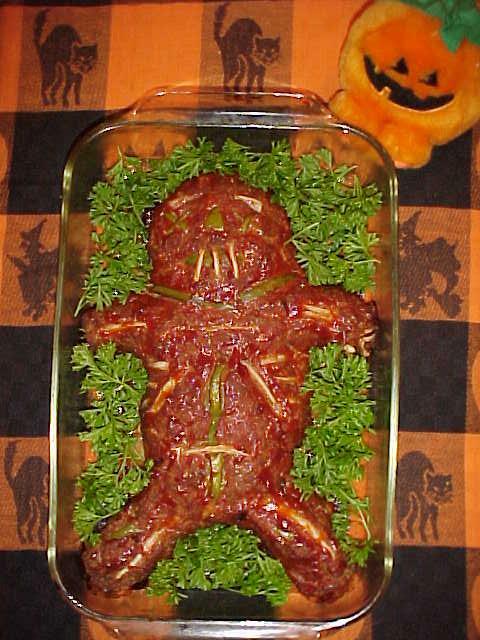 Shape the meatloaf into a Zombie, in the shape of a man. Place on a pan with low sides. Apply ketchup decoratively before baking. I use it all over the Zombie like blood or in decorative designs. Shape into the form of a man, starting with the body, and then forming a head, arms and legs. Use green pepper slices and bits to make the eyes, nose, and mouth. Red peppers make a great mouth. 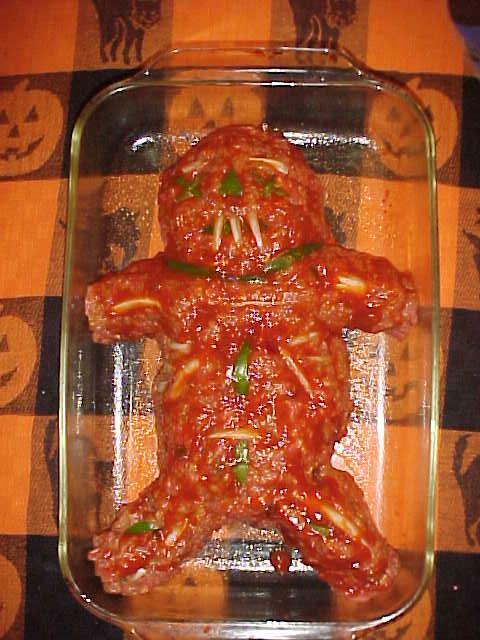 CLICK HERE to see how the Zombie Meatloaf lookes with garnish, tomato sauce, and after cooking. Make Jello in small cups, and set until ready. Place one scoop of Cool Whip in each cup...for the eye. Then place a berry or raisin on top for the pupil of the eye. You can use red food color to draw blood lines in the Cool Whip..like blood shot eyes. This one looks great and taste good too! No matter what type punch you have you can make it look great by doing some simple things. Get some surgical gloves, available at most drug stores. Fill each with water, or colored Kool Aid. Tie an knot in the end, where the wrist would be, and be sure they don't leak. Then put them into the freezer until frozen. When it is time to put out your punch, simply take the gloves with the ice now formed in them, and cut off the gloves. You should have ice in the form of a hand. If you use a clear punch or one light in color, use some red Kool Aid to make the ice with. The contrast in colors looks great. Just be careful with the fingers which can break easily. Use 7-Up or Sprite, poured over Vanilla ice cream. Put a drop of red food color into the Sprite. I used whipped cream too. It makes a fabulous float drink. Combine all the ingredients and serve. Makes about 20 cups. In a bowl or plastic Halloween pumpkin, stir together the condensed milk and pineapple juice. Top with sherbet and serve over ice. Refrigerate leftovers. Pour the cold milk into a large bowl and add pudding mixes. Beat with a wire whisk for about 2 minutes. Stir in 3 cups of whipped topping and 1/2 of the cookies. Spoon 2 tablespoons of cookie crumbs and 1/2 cup pudding into 15 individual cups. Top with the remaining crumbs. Decorate with the remaining whipped topping, dropped by the spoonful to make the ghosts. Add the M&M's or chocolate morsels for eyes. 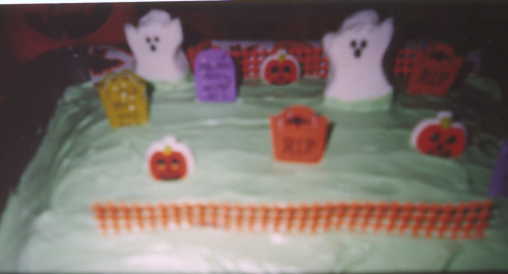 CLICK HERE to see a picture of my Graveyard cake. 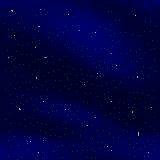 CLICK HERE to see another photo. Sorry, they didn't come out the greatest. All I did for the cake was to use any recipe at all. I used white icing and put green food color in it. The ghosts are marshmellow ghosts I got at Walmart for $1.00 a box. The tombstones are made of small pieces of wood, painted. I bought these ready made at Kmart for $1.00, but they can be made at home. For the dead tree, I used the branches off a grape vine, and hung a plastic bat ring in the vine. The pumpkins I got at Kmart for $1.00 too. They were edible. All in all the kids loved the design, and the ghosts were the first things eaten. CLICK HERE to see the rats! You will need a toy rubber or plastic mouse/rat. Press aluminum foil over the top of the rat, to form a mold cup that has the shape of the rat on the inside. Leave the bottom open and pull the toy rat out. Make a bunch of these aluminum rat cups. Use some additional foil to form legs so the molds sit open side up on a cookie sheet. Spray the inside of the foil rat molds with non-stick cooking spray, such as PAM, and fill each mold with chocolate cake batter. Leaving the molds on the cookie sheet for support, bake the rat cakes in the oven, and follow box instructions. You may find it helps to over bake them a bit. When finished baking, let cool and pull off the foil mold gently, and trim the bottom of the cupcake rat with a knife so it sits flat. 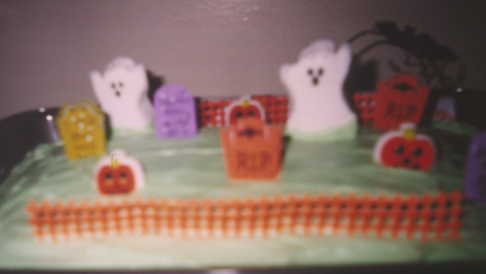 Use red cake icing in the little squeeze tubes to inject (from the bottom) the insides with a little gooey "blood", use licorice whips for a tail and red cake decorating beads, or red icing, for the eyes. You usually will only get one rat per mold so make plenty of the foil molds, they're easy to do. Candy corn makes great ears-stick them into the head pointy end down. This year instead of licorice I'm using gummi worms for tails, and may add some more gummi worms to the red icing guts. CLICK HERE to see the Green Mashed Potatoes and Green Swamp Jello, described below. This is soooo easy! And so very effective too! Simply make your favorite mashed potato recipe, and add some green food coloring to the potatoes when done. It gives them an eerie look, and they still taste great!! CLICK HERE to see Gummy Worm Brownies. This is super simple! Just make brownies and put gummy worms on top after the brownies cool! Kids just love this! Fingers You take hotdogs and cut them in half and then slice three cuts(not all the way through) in two quarters to look like knuckles and a slot out of the top for the nail. A water chestnut cut in half is used for the nail. Put the hotdogs in a baking dish and bake them, just a little, with BBQ sauce out the base of the fingers. The heart is made from any red Jello with a some melted cream cheese or evaporated milk added to make it opaque. For the blood, use Karo syrup with red food coloring added. You can purchase "Heart" molds from any Halloween store. I saw them in Garden Ridge, and Walmart also. Place the 'blood' in a small ziplock plastic bag. Pour half of the jello into the mold, put the "blood" in next, then fill the rest of the way with remaining Jello. When setting the Heart out to be cut, make sure you use a fairly sharp knife so it can puncture that bag. Of course, when the bag is punctured, the heart oozes the blood mixture, and makes a really neat bleeding heart! Be sure you keep your heart in a pan or dish that will catch the oozing blood!!! Make green jello. Put some into a plastic container. When the Jello starts to solidify, add gummy bugs, and/or worms! Beat the rest of the Jello into a froth, and add to the top. Let sit and enjoy...or gag! !